Agriculture Water not an Essential Service? Grapes need a minimum of 20 inches of precipitation minimum to survive each year. Other farmers farm other things where I live. Those farmers need ir-ri-ga-tion too. We farm to make money. We need money to live. What part of agricultural water is NOT an essential service? The local municipal workers’ union (CUPE) of the Town of Oliver have voted to go on strike. No problem with that. It is their right and I don’t want to get embroiled in the negotiation of wages between their union and the Town. Here’s the problem, they have called domestic water an essential service but agricultural water not an essential service. Therefore, the water flowing outside the town to maintain our million dollar investments, our livelihoods, the livelihood of the 24+ families we support at Tinhorn Creek, is not essential. Since when is one man’s access to water a right but for another man it is only an option? Farmers don’t complain in traditional media sources too much. They talk it in local coffee shops. They pull over on the side of the road. They lean over fences. Really. They do. I have done all three of these things. But farmers can roar when something like WATER is taken away from them. 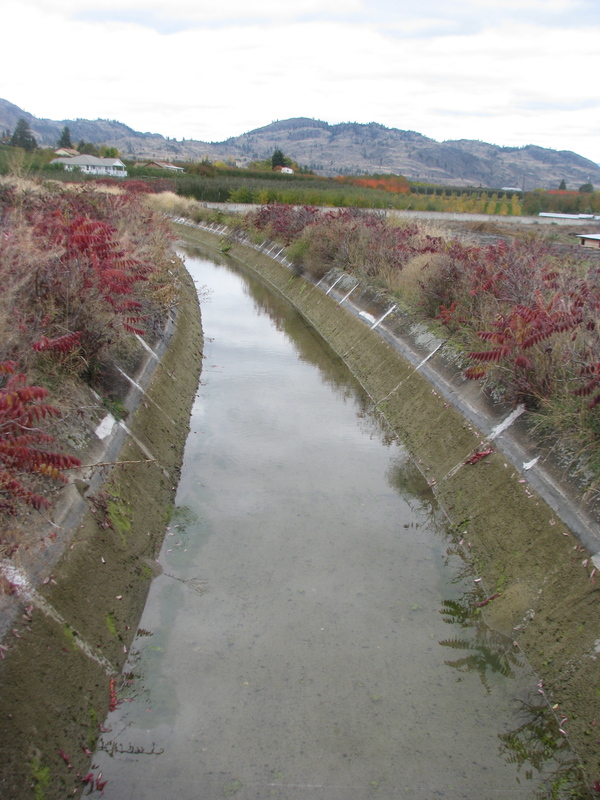 If water is not flowing in our irrigation canal (fondly called “the ditch”) in mid April, believe me…the whole province of British Columbia will hear about it. Not just readers of this blog. This entry was posted in Canada, Grapes and Wine, TInhorn Creek and tagged essential service, farmer, Grapes, irrigation, vines, vineyards, water. Bookmark the permalink. 2 Responses to Agriculture Water not an Essential Service? Well said, Sandra. A large contributor to a large tax base, Oliver and area’s farmers contribute significantly – especially as employers, and key stakeholders in tourism and agri-tourism. The unintended consequences would be of a scale I’m not sure anyone could anticipate. Let’s hope the conversation isn’t over.